Jon Weier is a Western University of Western Ontario PHD candidate working on a dissertation National and Religious identities in the Canadian, American and British YMCAs During the First World War was the speaker for the night. An unusual situation occurred before the talk. The power for the block of buildings in which the lecture was to occur went off and since the building was only on emergency power the people attend the event decided to walk to Cultures Coffee and retire there to have the seminar. It was a bit of a sight watching approximately 30 people tramping down Dalhousie Street in search of a building and business that had power. Please note that these notes are from the lecture and the author has added content from his own experience and perspective. Mr. Weier present his topic in rather unusual circumstances as the usual facilities where not available. His knowledge of his topic and reference to his visuals was a big help and the lack of them did not detract from his talk but would have enhanced it. Taking a moment to introduce himself and his interest in history and the involvement of the YMCA in the First World War Mr. Weier hope to present the role of commemoration if the First World War and its commemoration in Canada. As an example regarding perceptions of war he referenced the works by two works of art. One by British war artist Richard Jack and Canadian war artist and Group of Seven member, Frederick Varley. Both pictures show different conceptions of war by their form. One showing stoic Canadian heroism in the face of the enemy and the other showing the realistic aftermath of combat. “For What” by Frederick Varley, 1918. His interest in the First World War stemmed from a CBC radio program that investigated the alleged crucifixion of a Canadian soldier at Ypres called “Canada’s Golgotha”. Mr. Weier’s remarks reviewed the changes in attitudes towards war using movies and other media as examples. In 1979 a remake of the classic 1930s war film “All Quiet on the Western Front” adapted from the book of the same title by Erich Maria Remarque was released to television. This film may have served as a proxy to overt statements against the Vietnam War as the conflict deals from a German perspective of the First World War. The tensions and recent American defeat of the Vietnam war established an unpopularity of war movies. As the end of the Vietnam era came to a close the Cold War and its related tension in other geo-political areas stepped up the public concern for nuclear war. The Doomsday Clock was at some of its lowest points in its history and the threat of actual nuclear war was so present that several NATO countries produced TV series in an expression of this fear. Of note was “The Day After” aired by ABC November 20, 1983 and was the 7th highest rated non-sport show at that time in regards to viewers. BBC Two aired “Threads” September 23, 1984 and it had the highest ratings of any show on that channel up to that time. In addition cinema was making overt anti-war statements or portraying war in such a realistic manner as to visually, if not viscerally, impact the audience to respond to war. Of note are the American movies “Apocalypse Now” (1979) and “Platoon” (1986). Between the two moves “Apocalypse Now” is an adaptation of Joseph Conrad’s “Heart of Darkness” and other influences and is a strongly allegorical thematically and not representative of actual events. In contrast, “Platoon” is written and directed by Oliver Stone (twice wounded and Bronze Star recipient) was a deeply violent and disturbing movie based on his combat experience in Vietnam. Tom Berenger as Staff Sgt. Robert Barnes. The representation of the expression of war as the ends justifies the means. The use of terror and violence as necessary element of combat. In Canada three examples of this expression toward war are represented by the re-release of the 1928 novella by Canadian soldier Charles Yale Harrison “Generals Die in Bed” in 1975 by Potlach Books. This novella is currently available at bookstores and at Project Gutenberg. CBC radio produced a series entitled “Flanders Fields: Canadian Voices in World War 1” (available at iTunes and CD through the local library) took the position biased to the common soldier versus the hierarchy and bureaucracy of the Officer class. Of note was organization The War Amps. This organization was founded in 1918 in direct response to a need generated by war – the support of amputees resulting from wounds and injuries sustained by Canadian soldiers in the First World War. 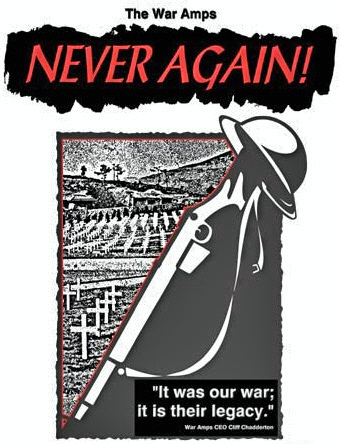 This organization to a stance with a series of films thematically connected and called “Never Again”. This sentiment is further given expression that “there is no victory in war” from the failed peace-keeping missions in Somalia and the genocides of Rwanda and the former Yugoslavia. 1990 leads to push back against anti-war sentiment and a renewed interest in the military achievements of the Canadian Forces during the Second World War. This is, in part, because of the 50th Anniversary of many of the events of this war and it represented most effectively by the movie “Saving Private Ryan” (1998) and the HBO series “Band of Brothers” (2001). In Canada the 3 part CBC documentary series “The Valour and the Horror” (1992). The Canadian Legion reacts to the series as it does not agree with the portrayal of Bomber Command and “Bomber Harris”. Veterans respond that this series does not reflect their perspective of the war and does not reflect the historical necessity of the bombing war. It is interesting to note that only two of the installments are available at the NFB web site for viewing. The Dieppe Raid is also reexamined for its utility and value to the war effort and questions the necessity of this action which cost so much in Canadian lives. The active participation of the Federal Government in commemoration of the First World War is minimal. Possible influences in this down-graded role is its past experience with the bi-centennial of The War 0f 1812, which was not very successful due to poor execution. In response to this the creation of non-profit groups such as Active History and groups like the Great War Centenary Association, Oxford County, and individuals using social media and other resources takes up the “slack” of government efforts. Creation of not-for-profit groups. Historica Dominion created from two groups to put a different perspective of Canada’s history of the First World War. Birth of the Reform Party with a military heritage. Lester Pearson St. Laurent – peace. Warrior mythology with support to war on terror and in Afghanistan. The movie “Passchendaele” (2008) had support from the Canadian Government and the Dominion Institute. The 2nd and 3rd Battle of Ypres as representative of the futility of war. The Battle of Vimy Ridge and the Last 100 Days as representative of the birth of the Canadian nation and the elite reputation of Canadian troops at the sharp end. Contrasting the Canadian efforts with the British efforts illustrates the greater commitment of the UK government and public to the First World War centenary where as some of the efforts are private and have suffered negative publicity, such as the the Never Forgotten War Memorial in Cape Breton. Poppies representing all the UK soldiers who perished in WW1 at the Tower of London. www.activehistory.ca is looking for articles about the First World War and perspectives on history and any contributions would be appreciated. The lecture offered a comprehensive overview of the social context of the resent perceptional developments that would have influenced Canadians in their perspective of war, and particularly, the First World War. There is a robust local and national interest in the war and its commemoration using the tools of technology but the Canadian Government is not leading this effort. Thanks to all the volunteers of the GWCA and the staff at the Brantford Coffee Culture that had an inundation of customers due to the power outage. Thanks to Jon Weier for knowing his “stuff” so well that he switched horses in stride and seamlessly gave a great lecture.